Company officials say instead of taking four to five hours to complete 90 to 110 kilometres, you can now get to your destination by boat in only two and a half hours. March 18—A private company has come up with a way of make travelling between Kampala and Jinja less stressful. Four months after an ill-fated cruise boat capsized on Lake Victoria, a new business venture wants to exploit this market on top of also providing an alternative to the congested 100-kilometre highway between Kampala and Jinja. During the last week of November last year, the makeshift and overloaded MV Templar, went down with a loss of just over 30 revelers. But according to maritime sources, the demand for leisure boat rides on the world’s biggest freshwater lake remains unabated. 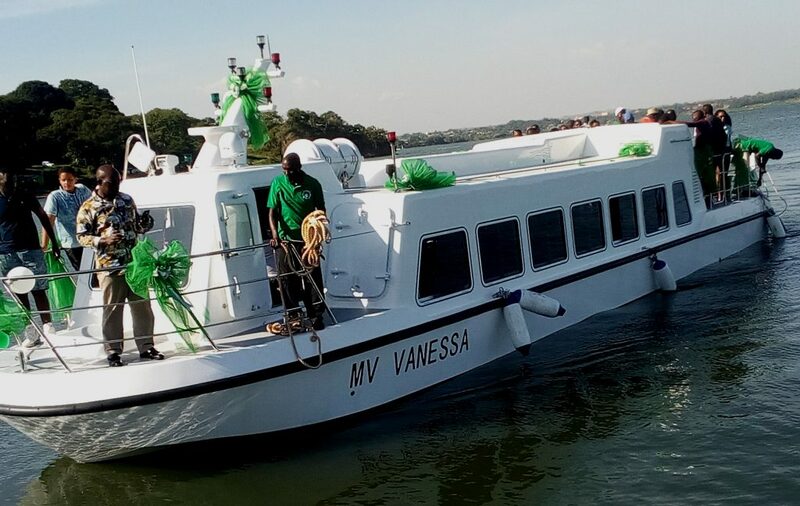 Nyanza Evergreen Waterways are offering a specially fitted 54-seater boat, the MV Vanessa, with a basic fare of $40 for a one-way trip to Jinja. Olivier van Pee, the company CEO said at the official launch recently, the new vessel will give a safer and more comfortable alternative to road transport to travelers and tourists. “We wanted to give an alternative means of transport, apart from the road for tourists and Ugandan travelers. We understand the stereotypes associated with water transport, but our vessels are, new, safe and internationally certified. We are also working with all the concerned agencies in Uganda to ensure that all safety procedures are fulfilled.” Van Pee has had several years experience in the regional logistics business. The $40 is a concession for anyone travelling in a group of at least 10 people. Otherwise normal one-way fares range from $45 (UGX165,000) to $50 or $85 to $90 for a return ticket. Company officials say a four to five hour journey by road, would take the new craft half the time and in better comfort. On the other hand, ordinary business people, who regularly shuttle between Kampala and Jinja, say the added convenience cannot compensate for the higher transport costs. It costs no more that UGX10,000 (or nearly $3) to travel by minibus to Jinja from Kampala. Three days a week, MV Vanessa will hug the Lake Victoria shores between Entebbe and Jinja with plans to also take in Kalangala, Port Bell and other lakeshore destinations. The boat is also available for private charters. “This is a modern, comfortable and safe boat, the first of its kind on Lake Victoria. With more innovations like this from the private sector, tourism in Uganda will become even better,” Lilly Ajarova, the incoming Uganda Tourism Board Chief Executive Officer said. The potential for developing Uganda’s lakeshore tourism has largely remained untapped due to the relatively high costs of the cruise boats. Uganda’s share of the Lake Victoria is the largest, complete with some of the most picturesque islands, but investment has remained modest. In contrast, Egypt has a well advanced river cruise industry, including floating hotels. Latest estimates put the Egyptian total boat numbers at 300 and annual revenues of close to $4 billion. Two decades ago, an Egyptian investor mooted the idea of setting a cruise operation in Uganda, but later pulled out for lack of government support. He not only wanted a government injection of cash, but also tax incentives. Amos Wekesa, the owner of Great Lakes Safaris and a leading spokesperson for the local tourism industry said there was a need for relevant Ugandan authorities to re-strategise marketing and branding of the country if it is going to compete favourably in the region. Wekesa said Uganda is still doing poorly as a tourism destination mainly because it has not developed it’s capacity and structures to attract and serve big numbers.